And again, although the English translation doesn’t support it, the original has Werther die clad in his “blauen Frack mit gelber Weste” (blue coat and yellow waistcoat). Just as suicides became popular together with the publication of the novel, blue coat became even more so. Suddenly young men wanted to be like Werther. In Jane Austen’s Pride and Prejudice two men wear a blue coat: Bingley and Wickham. 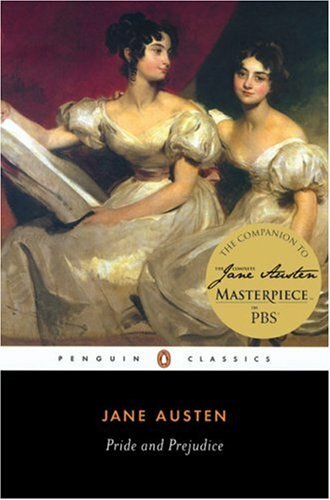 True to Austen’s style, everything in her novel is doubled and twisted. Bingley is an honest man, but careless as Werther was. His writing style that he is so proud of is an imitation of Werther’s carelessness in letter writing. Bingley resembles Goethe’s protagonist in his social behaviour as well. He’s kind to those who are lower on the social ladder, and unconcerned with titles. The very first thing the girls notice about him is that he wears blue coat. We learn then that he’s romantic in advance. Yet his negligence in observing etiquette has its drawbacks. He asks Jane twice to dance with him on the first occasion, causing gossip that he yet doesn’t know he’s likely to follow. We know that, like Werther again, he was in love before. There must have been ladies with broken hearts and disappointed hopes. At the same time he overlooks Lizzy for his “Angel”, once more, Werther’s nickname for his sweetheart, causing her to sit down a dance when he should be dancing with her. In my opinion his conduct is a result of thoughtlessness. In this he’s similar to Marianne, in love with the image of himself, styled upon Werther’s example, without consideration for the feelings of others, because he cannot imagine he could hurt. Bingley’s indecision mirrors that of Werther’s as well. Wickham, on the other hand, is deliberation itself. His every move is counted in advance. He’s no gentleman, he acts one. He pursues money and social promotion, but pretends to be honestly concerned with those around him. His manners are impeccable, always thoughtful, but false. We never see him in love, we only see women who believe him to be in love with them. At the end it’s Lydia who hopes he’ll wed her in his blue coat – the very symbol of romantic soul in a man. And yet we have no doubt that he holds no such feelings for her. Wickham doesn’t care that he might hurt others, or even hurts them deliberately. In both Bingley and Wickham’s examples the blue coat is just a pretence. Then there is Darcy, of whose coats we never hear that they are blue, yet he is the man whose love cannot be equalled in either strength or passion by the other two. He’s always thoughtful, although unconcerned with pretensions. He chooses affection over money, yet he doesn’t flirt. His every decision is deliberate, but marked with honesty. He doesn’t pretend anything, either before himself or others. He doesn’t need a blue coat, because he doesn’t need to prove anything.